Bob's Chevy Trucks brings you their jam-packed Chevy truck parts catalog, featuring hundreds of Chevy truck parts and accessories for your 1947 to 1972 Chevy and GMC models. Bob's Chevy Truck parts catalog - Bob's Chevy Trucks understands that very special bond that exists between a Chevy truck owner and his or her classic Chevy automobile. No matter what hard-to-find Chevy truck parts and accessories your classic truck desires, you'll find the most complete selection of Chevy restoration parts for Chevrolet and GMC Pickups, Suburbans and Blazers, all in the pages of Bob's Chevy truck parts catalog. Chevy truck restoration parts - Before you begin any Chevy truck restoration, you need to have the right tools, the right frame of mind and the right Chevy parts and accessories stocked in your garage. Lucky for you, Bob's Chevy Truck parts catalog has all of your major tools, parts and accessories covered with an extensive collection of premium GMC and Chevy truck restoration parts spanning the years 1947, 1972, and every year in between. From restoration tools to specialty paints and supplies, the best Chevy restorations begin with a pit stop at Bob's Chevy Trucks. Chevy truck body parts - Refurbish, renovate and repair the body of your late and great Chevy model truck with a prime selection of body altering parts. From body hardware to body repair panels, truck hoods to front and rear fenders, you'll have access to the Chevy truck body parts that will take years off of your late forties, fifties, sixties and early seventies Chevy Trucks! 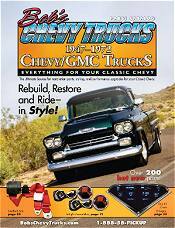 Chevy truck accessories - Whether you're in the market for old Chevy truck parts and accessories for your classic truck's interior or exterior, Bob's Chevy Truck parts catalog features a wide assortment of products that will add value to every inch of your truck from the inside out. Choose from custom tailored truck covers, deluxe interior kits, seat belts and old school seat covers, dashboard and trunk related accessories, carpet mats, exterior trim, decals and so much more. Trust Bob's Chevy truck parts catalog to provide you with an all-encompassing collection of Chevy truck restoration parts, styling and performance upgrades, featuring GMC truck parts from 1947 to 1972 Chevy truck parts and accessories that will recondition your classic ride.